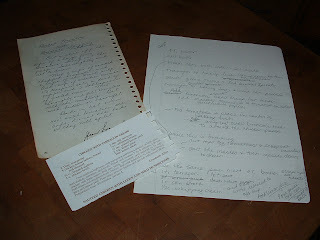 With this recipe I found two old scraps of recipes (Chicken with Tarragon Sauce and Baked Tomatoes with Broccoli stuffing) that had been torn from old cookbooklets, one was even handwritten it was so old. 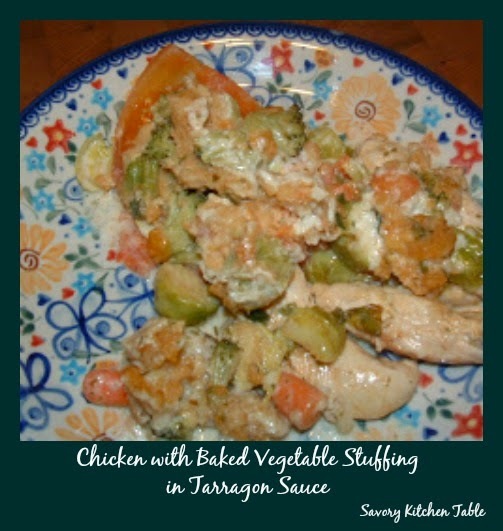 The Brussel Sprouts and carrots were my addition for texture and color. They begged me to put them together and make this dish. Serves 4. Melt 4 tablespoons butter in skillet. Brown each side of chicken piece. While the chicken is browning, wash the tomatoes and cut the tops off. Scoop the insides out*, salt the insides and turn the tomatoes upside down to drain. 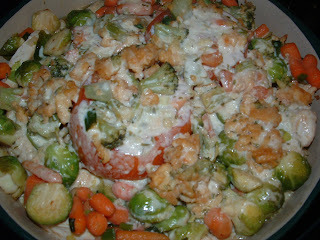 Transfer chicken pieces to baking dish, but leave enough room for the tomatoes in the center. 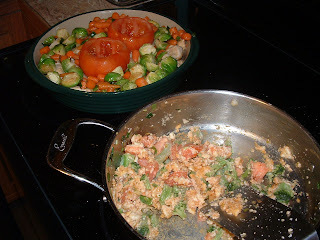 Add the carrots and Brussel sprouts and saute' until tender. Transfer them to the baking dishes scattered over the chicken pieces. 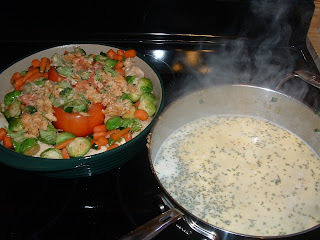 Add the broccoli, tomato pulp and green onions to the skillet and saute' until tender. Transfer to a mixing bowl and add crackers. Fill tomato cups. 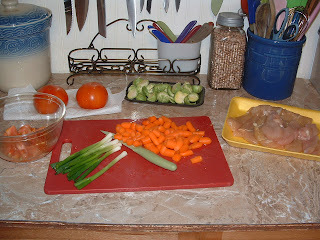 Add any remaining broccoli mixture to the chicken . Add chicken broth, tarragon, salt, pepper and whipping cream. Bring to a boil while whisking constantly to prevent scorching. Add lemon juice after it boils. Immediately pour over the whole thing. Bake for 1 hour at 325 degrees. By using the larger tomatoes you can cut them in half after baking and have a nice presentation on the plate. *I use a grapefruit knife and it works SUPER! **I used Brussel Sprouts tonight, but in the future will use all broccoli.